Here's another mini ice cream bar which I couldn't resist buying. 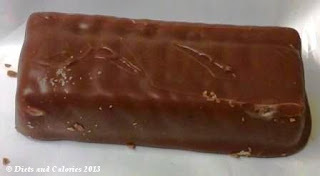 Mars Mini Ice Cream Bars are miniature ice cream versions of the Mars Bar. 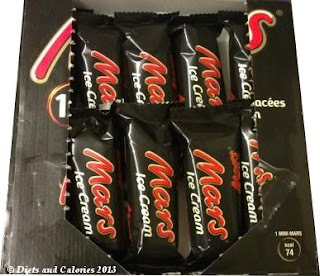 You can already buy Mars Ice Cream Bars in a larger size (51ml), but these new Mini Mars are only half the size with, of course, fewer calories. 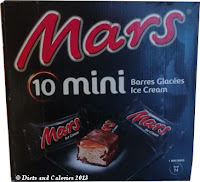 Mini Mars Ice Creams are packed 10 to a box. 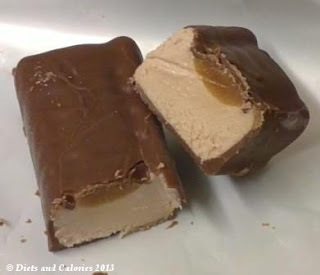 They look just like a Mars Bar, with a layer of chocolate on the outside, while on the inside there's a layer of chocolate flavour ice cream topped with caramel (18%). They're such a dinky little size, measuring just 6.5cm x 2.5cm (2.5” x 1”). It'd be so easy to eat them in two bites, but where's the enjoyment in that? These bite-sized treats deserve to be nibbled rather than bitten. This way you can extend your treat that bit longer. They taste wonderful. The chocolate is nice and crunchy if you eat it straight from the freezer, while the ice cream is lovely and creamy with a gorgeous chocolatey flavour. The caramel remains all gooey, despite being 'frozen'. A real treat in a perfect treat sized portion. OK, so they're not exactly healthy, but this is the way to enjoy treats such as ice cream, chocolate and caramel – in miniature version. 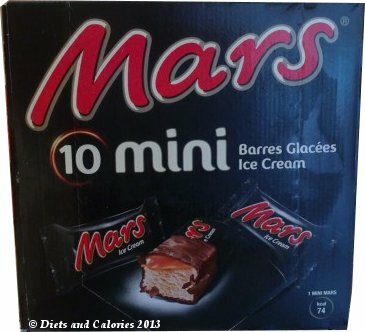 Each Mars Mini ice cream has 74 calories. They're not quite half the calories of a regular sized Mars Ice Cream which has 139 calories per bar. They free from artificial colours or flavours. Nutrition information per mini mars (25.4ml): 74 calories, 0.9g protein, 8.4g carbohydrates, 6.5g sugars, 4.1g fat, 2.7g saturates, 0.2g fibre, 0.02g sodium.